Sturdy wood-core construction with attractive textured Putty vinyl laminate finish. 2" swivel casters for easy mobility. 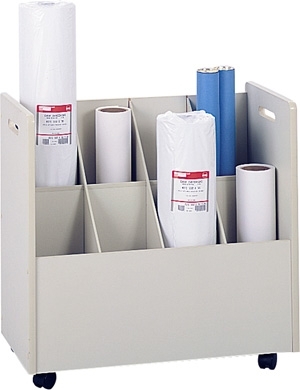 Grandstand design with over sized square tubes that easily handle multiple print storage or large rolls of paper. Assembly is quick and easy. Tube size: 8 Compartments and each are 7" square.